–Free Wrapp Gift Cards – Free $15 Little Black Bag Card, Free $10 Clarins Gift Card, Free $10 Tommy Hilfiger Gift Card, Free $6 to H&M, Free $5 to American Apparel, Free $5 to Office Depot, Hulu Plus for 2 weeks Free and more! –Rebecca Minkoff sale – Up to 60% Off + Extra 20% Off Sale with promo code: SUNNY20. Free shipping over $250. This entry was posted in Hot Deals, Uncategorized on August 31, 2013 by Crodeal. Unfortunately the weather forecast for this year’s Labor Day weekend here in New York isn’t as sunny and bright as I had opened. Instead, we have chances of rain and scattered t-storms. Make sure you get your travel umbrella and be ready for unpredictable scattered rain. 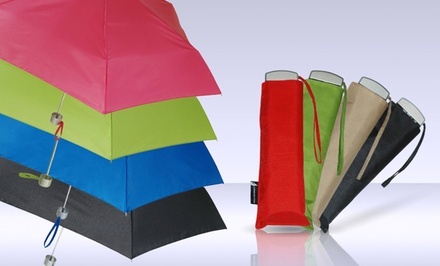 Here is a Groupon deal that I found for travel umbrellas for only $13.99. The original price on this is $30! There are multiple colors available and there are free returns. These umbrellas are durable and are small enough that you can just put it in your bag for those days when there is a chance of rain. This entry was posted in Uncategorized on August 31, 2013 by Crodeal. Tory Burch sale – 20% off purchases of $300, 25% off $500, and 30% off $750 using promo code: LABORDAY. Get free shipping on orders $300+. I love wearing the Tory Burch Reva ballet flats because they generally go nice with any outfit. I also own a pair of Tory Burch flip flops. They are simple and can easily be paired up with any summer outfit! I’d say the flip flops sale are a steal because these Tory Burch shoewear does not get any cheaper than that! Let’s not forget about their cute bags…I love their crossbody bags and their clutches are great for an evening out! This entry was posted in Hot Deals on August 29, 2013 by Crodeal.